BSNL has started E-Auction of fancy and vanity mobile numbers. The e-auction will happen between August 2, 2017, and August 8, 2017, through the company’s online portal eauction.bsnl.co.in, and SMS service. For the unaware, BSNL conducts an e-auction for all a specific sequence of numbers, which includes vanity/premium/fancy. To participate in the auction, customers must access BSNL E-auction website and register by paying the registration fee of Rs. 150. Once logged in, the customer must give his complete address to participate in the auction. The Rs. 150 will deduct from the user’s prepaid balance, if he is a prepaid customer, or will be added to the monthly rental next month. Alternatively, BSNL says that the users can participate in the auction via SMS as well. Here’s how it works: Registered customers have to place a bid for a particular number by paying Rs. 150. And the vanity numbers range from Rs. 3,000 to Rs. 50,000. BSNL will choose the highest placed bid for a number and will intimate the customer via an SMS or email to the registered mail address. 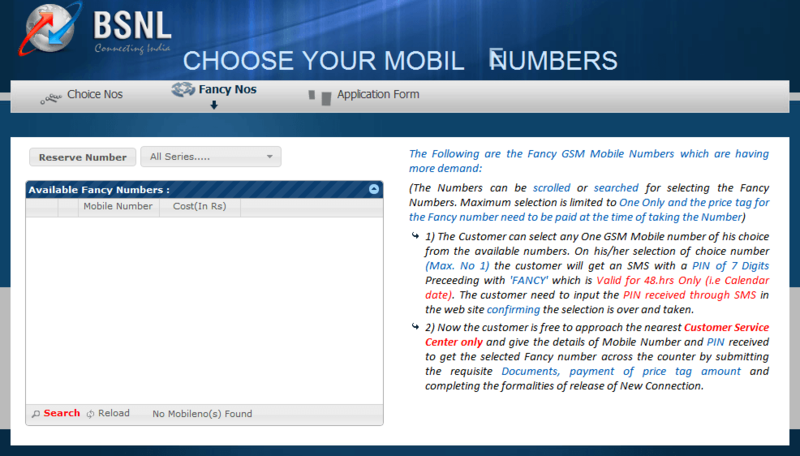 As stated earlier, customers can also bid for the vanity numbers via SMS. Here’s how it works. Firstly, customers have to check the vanity numbers list. And they can do by sending an SMS to VLIST < PATTERN> to 56666. That said, an SMS cost would be Rs. 3. And as usual, Rs. 3 will be deducted from your prepaid account or will be added to the monthly rental if you’re a postpaid customer. Having said that, the customer has to pay the bidding amount while taking the vanity number at the nearest BSNL store. Furthermore, if a customer fails to take his number in five days from allocating to him, then the second highest bidder will receive an SMS to get the SIM card, and if he doesn’t take the SIM card in five days, then the third highest bidder will be intimated. Bsnl still uses ancient Adobe Flash for this website? ROFL. This nonsense should be banned. Nothing but VIP culture. All numbers should be available public without discrimination.